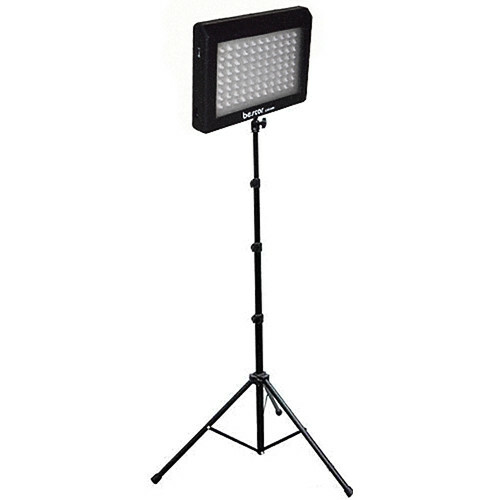 The Bescor LED-95DS95W Kit is a great way for videographers on the run to light interviews, events or spot news. The dimming 6500K light contains 88 LEDs that output the equivalent of 95W. The featherweight (20 oz) fixture has a 1/4"-20 tap for the included 70.86" stand and will take stand mounts and other accessories that match that thread. Power options include the provided 110V AC adapter or 6 optional AA batteries which provide up to 2.5 hours of run time. Box Dimensions (LxWxH) 26.0 x 14.3 x 4.4"
LED-95DS 95W Kit is rated 3.0 out of 5 by 9. Rated 2 out of 5 by Anonymous from Don't waste your money. I purchased this unit for an indoor family portrait shoot at a client's home. As soon as I put the batteries in and fired it up for the first time, one of the LEDs started flickering, and went out. Slapping the side of the unit brings it back to life, but only temporarily. Light output is less than that of other cheaper LED panels that I own. Dimmer functions, but not well. If the stand weren't at least decent, I would have sent it back. Dissapointing product. Almost embarrassed to use it. Rated 1 out of 5 by Mark - The Portland Pick from Bought and returned right away Unless you've got a sturdy case to put these in I would not recommend getting these. They are plastic and not durable at all. In fact they didn't make it to my house without breaking during shipping. There are way better things out there and for way cheaper too. Rated 4 out of 5 by Filmstress from Bescor LED light Well I was excited to receive my light except for the fact that someone used it and then reboxed it with old batteries that corrupted it in the back. I didn't appreciate that and that was quite ghetto that B & H would ship a product like that. No worries it works, I just like to purchase products that folks haevn't used. I do like it is portable and you can use it outside as well as inside. I don't like that is doesn't have another colored filter like my light for my camera. Overall it serves it purpose. Rated 3 out of 5 by DJLonS from Great light, bad casing... I give this item 4 stars based on the light alone that comes out of it. It is a really good video light. And the fact that it is battery operated is great. Now if they had gone one step further and set it up so that I could have used my existing Sony batteries that would have given this a four star rating easily. I have to lower it because of the cheap casing they used. I would have paid more if the casing were aluminum and even more if they allowed for the use of different types of batteries (Sony NPF's specifically). It's 95 watts and dimmable which is great. The power supplied by the 6 Double A batteries only lasts about 80 minutes then the LED's start to fade. Which isn't bad. The supplied power cable they give you won't even reach to the bottom of the C stand which comes with it. They needed to do some rethinking on that one too. But as I already stated the light output is good. Just get a nice case to carry it in or you're gonna break it. Rated 2 out of 5 by Frozen Sea from Could be better pros: cheap Pretty decent stand doesnt run that hot. cons: Material seems pretty bad quality Light power isn't good enough I think for this range of price (maybe a couple of bucks more) you could go on similar product better quality. Rated 5 out of 5 by photogirl from All purpose Easy to use, portable. Great light , So far so good! Easy to adjust to any given light conditions. Rated 5 out of 5 by Brent from Great for the price My buddies and I recently began making amateur movies for college as well as pleasure. I decided I wanted my own light so I didn't have to keep checking one out from the school. This light was great for what we needed. Easily transportable, bright and runs on AA batteries. This thing is great, I can carry it around in my backpack and it barely weighs a thing. The plastic casing could pose a problem if your not careful with it though. Rated 1 out of 5 by Anonymous from very poor quality very bad quality. light is not natural. Don't buy it. How do I mount the LED 950 light to the Bescor tripod ?? Honestly it's a horrible design. It broke twice and never bothered returning it. I wouldn't recommend!